After I read about the negative sides of parabens, I have been switching more to natural products than I was before, especially when it comes to my babies' product. Unfortunately parabens are everywhere, in most commercial products. They can be found in all soaps, body washes, shampoos, and moisturizers. 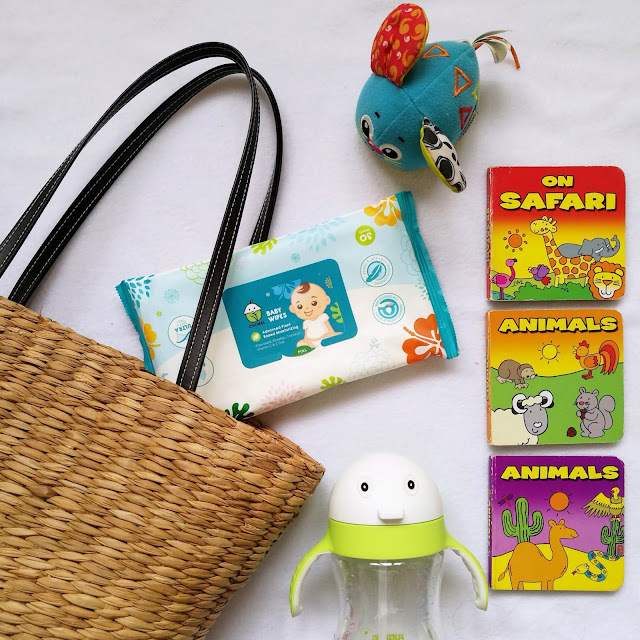 I first heard of Chomel Baby products when Babydash.com agreed to sponsor for our International Babywearing Event last October and one of the items they gave was Chomel Baby Breast Pump and Bottle Cleanser. And now I got the chance to try their baby Head to Toe Wash, Daily Lotion and Baby Wipes. 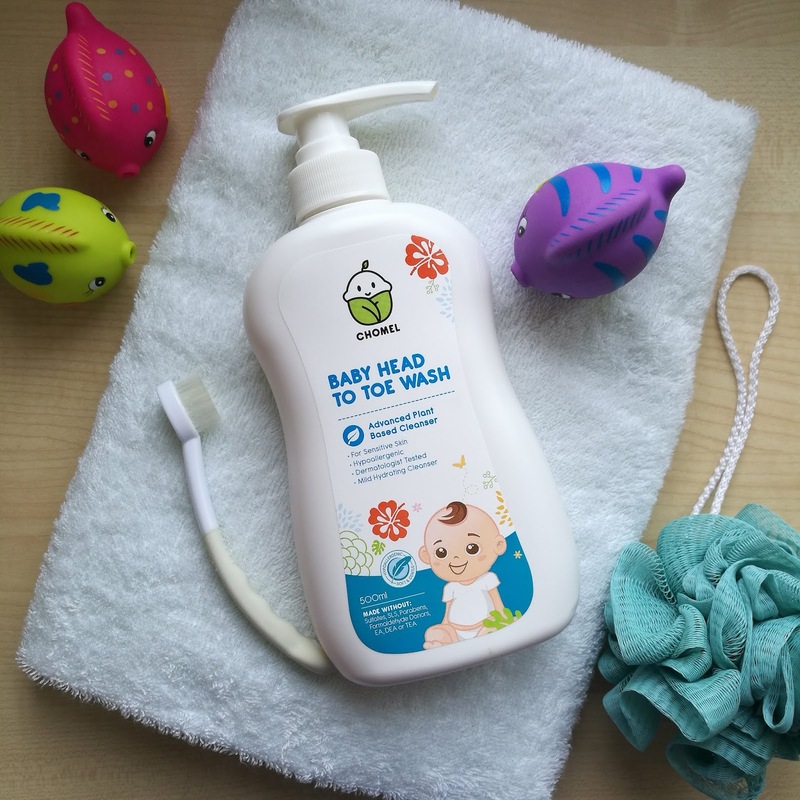 Chomel Baby Head to Toe Wash is formulated without sulfates, SLS/SLES, parabens and some other chemicals that normally used in most commercial baby wash products. 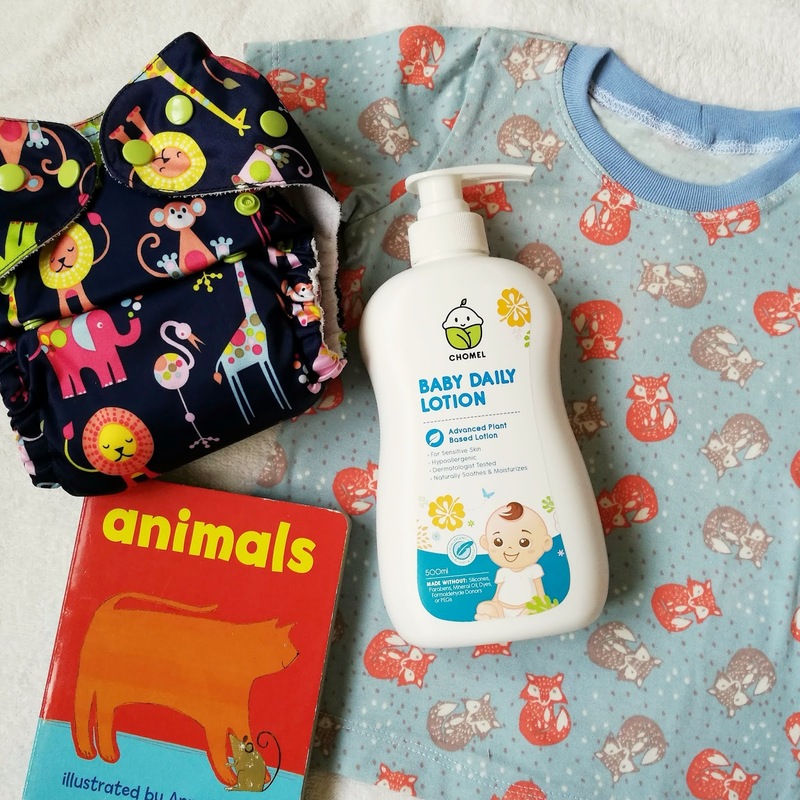 Chomel Baby wash uses plant based cleansing ingredients, coconut oil and natural moisturizers such as flaxseed and rosehip which makes it works great on newborn baby and babies with sensitive skin. Plus, it smells amazing too! Beside helping to soothe your baby, massage has many benefits for them including improving circulation and easing teething pain. After bath is one of the ideal times for a massage as their skin is still moist - a perfect time to apply oil or lotion, like Chomel Baby Daily Lotion. Chomel Baby Daily Lotion feels very soft and gentle when applied to the skin. And of cos, it is not greasy! Just like their baby wash, the lotion also uses natural ingredients such as flaxseed, rosehip, coconut & monoi tiare oils. It is also infused with Vitamin C & E to help strengthen the skin barrier and making it healthy and soft. Oh, don't forget about their baby wipes! The wipes are extra soft, ultra thick and durable. They contain extra moistures to ease cleaning baby related mess, and of course and adult too! Most importantly, Chomel Baby Products products are certified hypoallergenic and tested by dermatologist for sensitive skin, and certified Halal by Jakim Malaysia. Go check out their website (click here!) to get to know more about this brand! Also check their FACEBOOK PAGE HERE and INSTAGRAM HERE. P/S: I should really get Chomel Baby Travel Kit too! Really convenience for me to bring every where we go. Plus, it contains the hand sanitizer too. * This post is sponsored by Chomel Baby products. Bestnya kalau ada bababy kecik kan...banyak jer barangan penjagaan kulit untuk baby yang chomel2, teruja plak SA tgok..tp dh tua dh..cukup la ada anak buah je...siyesly packaging tu comel betul..
Nina pun antara pengguna produk Chomel. Nina guna Chomel chair spray. Spray spray lap kat baby chair, meja dulu sebelum baby duduk. Terutama bila makan kat luar. Selain tu boleh gak lap mainkan dia. Lebih yakin bila dah bersih. Lagipun produk Chomel harganya berpatutan. Memang best produk dari chomel ni.. Min pun dah menggunakannya ke anak buah min.. Ternyata baby selesa dan wangi sentiasa. Eh! Hehe..
Good review! As baby's skin are highly sensitive, it is always best and I always recommend to use natural products. And good to know they are taking things like Halal status and safety assurance on the products too. Would recommend this to my friends! Brand chomel ini memang bagus kan sebab selamat and plant-based untuk si kecil. :) So ibu-bapa pun boleh ada peace of mind ketika jaga bayi dengan menggunakan produk mereka. hahhaha nama product also very comel.. haha anyway good to have more and more options for the parents to choose! and thanks for sharing, they can have more details about it! always go with the natural products as baby's skin are really sensitive. i would suggest this brand to my sister soon! Chomel je nama produk ni..secomel anak2 yang menggunakan barangan ni..:). Kalau untuk anak memang TB suka pilih yang Natural sebab yakin ia tiada bahan kimia dan semulajadi .. sesuai sangat untuk kulit baby yang sensitif mahupun kulit normal.. bau yang tidak kuat dan selamat untuk baby.. TB pun dah pakai produk yang natural juga sebab TB sendiri ada masalah kulit sensitif..
Produk chomel mmg bagus kak pernah guna utk cucu, berkualiti dan terrain. I've tried using Chomel products before, pretty good, will try this range next time, my daughter's body wash is finishing soon. Chomel's children's product is very well-suited to the sensible and essential children's skins that need careful care.